For many touring bands, the road is their home away from home, an ever-rolling muse that runs beneath their tires and works its way into every aspect of their lives, including their songwriting. For hard- traveling Americana duo The Nouveaux Honkies, the road is literally their home, as the two live out of a creatively rebuilt RV that they use to tour throughout the year in the American South. Rolling along in their high tech, solar powered, self-sufficient chariot, equipped with its own espresso bar, mini studio, and more comforts than most studio apartments in NYC, Tim O’Donnell and Rebecca Dawkins worked out a great formula to tie their travels to their music. They set up in a key American city for a couple months at a time, soaking up inspiration and making friends, before moving on. In this way, their new album Blues For Country, draws its sounds from the musical influences of New Orleans, Nashville, Florida, Austin, and the Texas hill country where they recorded it. 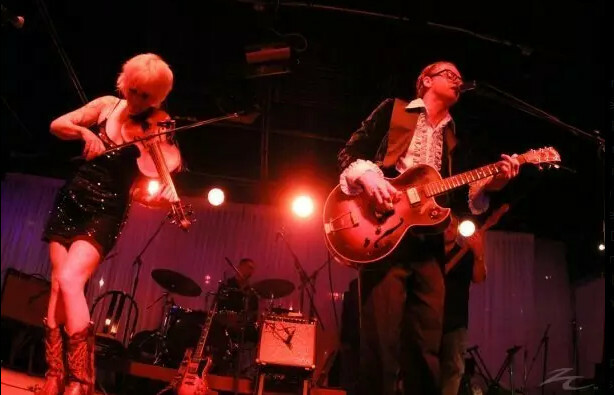 “As far as genres are concerned, I don’t think it is an intentional thing for us to be bouncing around the map,” confesses Tim O’Donnell, The Nouveaux Honkies’ songwriter and lead singer. “It is just my personality. I love lots of stuff. To me there is good music and bad music and I really have no formula on what it is. I just know when I like it. Jimmy Webb, Jimmy Reed, and Jimi Hendrix all give me this crazy feeling when I listen to them.” With all these regional flavors, it’s no wonder The Nouveaux Honkies’ music jumps so easily and happily between genres, mixing up a bubbling Americana gumbo of blues, country, roots, R&B, Texas swing, honky-tonk and old-fashioned songwriting. To record Blues for Country, The Nouveaux Honkies pulled their RV into the peaceful hill country town of Dripping Springs, Texas, a tiny town 30 minutes West of Austin. “We had our dogs, our espresso machine, our bed, our kitchen and the whole thing was super relaxed,” remembers Dawkins. “I think it reflects in the recording. It doesn’t feel frantic or rushed even though we were in and out in 8 days.” On Blues for Country, O’Donnell’s whiskey-tinged vocals are a perfect match for Rebecca Dawkins’ glorious harmonies and soaring fiddling; the two of them can sound as charming as an old-school country duet like Parton and Wagoner, or as bittersweet as that old recording of Townes Van Zandt and Emmylou Harris. In fact, the two cover Van Zandt’s “Pancho and Lefty” on the new album, though most of the songs are originals from O’Donnell’s pen. O’Donnell’s songs track the road-rambling ways of The Nouveaux Honkies, from “Life Ain’t Easy,” an unvarnished look at the touring life of musicians, to “I Know Things You Read About,” a funny song that speaks to the hard-won life skills learned on the road, or “Hours Into Days,” which sadly chronicles the distance that can well up between two people. O’Donnell’s the best kind of songwriter–able to swing between bitingly funny and touchingly honest–and he showcases this on stellar songs like the opening track “Blues for Country,” which perfectly mixes R&B vocal swagger with Dawkin’s country fiddle. On Blues for Country, The Nouveaux Honkies roll hard through songs that have soaked up the fresh air of the American backroads this duo drive through every day, informed by all the great cities of the South, and beholden only to the open road.